The quintessence of networking has always been that individuals or organizations have used their direct and indirect contacts to mobilize support, to share ideas, or to sell products and services. In the meantime, a series of specialized methods have been developed to collect and analyze such egocentric network data. 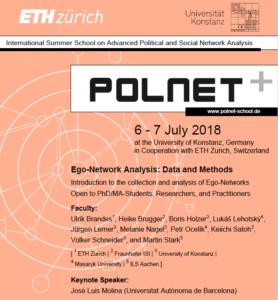 These methods will be the focus of the upcoming summer school Polnet Plus, which this year will be jointly organized by Ulrik Brandes (ETH Zurich) and Volker Schneider (University of Konstanz) at the University of Konstanz at July 6 and 7, 2018. The summer school includes a keynote speech by José Luis Molina (Universitat Autònoma de Barcelona), various sessions that introduce the participants into the topic, the collection of egocentric network data with VennMaker, the visualization of such data in visone, and the basics of ego-network data analysis in R.
Esta entrada fue publicada en General por José Luis Molina. Guarda el enlace permanente.